Spend the day at the carnival for a day of excitement at the Funhouse. Click here to play! You’ll be making your way through the crazy mirrors for a chance to bring in plenty of big money wins. The key symbol in this fun filled game is the Funhouse symbol. You’ll want to try to collect three of them across the paylines to bring in the biggest wins. Line 1 pays out 1000 coins, line 2 pays out 1500 coins, line 3 pays out 2000 coins, line 4 pays out 2500 coins, and line 5 pays out a massive 5000 coins! This symbols is also a wild and will replace all others to help you collect even more wins. Also keep an eye out for the candy symbols, as these delicious treats will get you up to 80 coins. 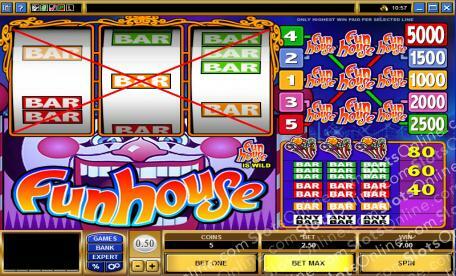 Finally, there are triple, double, and single BARS to help you bring in your fortune in this crazy house. Spin the reels of the Funhouse. It’s a fun adventure that could see you walking away with a pocket full of cash! The Funhouse logo is a wild symbol. It will replace all others to help you spin in more winning combinations. It also holds the top payout of the game if you can spin three of them across one of the five paylines.